Vladimir Shreydler, reporter with the Russian NGO Za Prava Cheloveka [For Human Rights] attended the hearing of Nadiya Savchenko in Moscow’s Basmanny District Court on April 17, 2015, and spoke with her, as well as her attorneys Nikolay Polozov and Ilya Novikov. 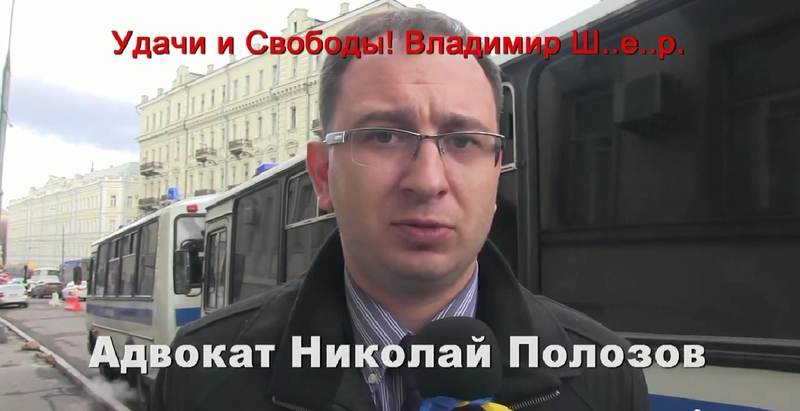 NIKOLAY POLOZOV, attorney: Today, the Basmanny District Court, in the person of Presiding Judge Levashova, has once again denied satisfaction to the appeal against the resolution of the investigation, filed by Nadiya Savchenko’s defense. Today, we were appealing the resolution that denied satisfaction to our petition to stop criminal proceedings against Nadiya Savchenko. 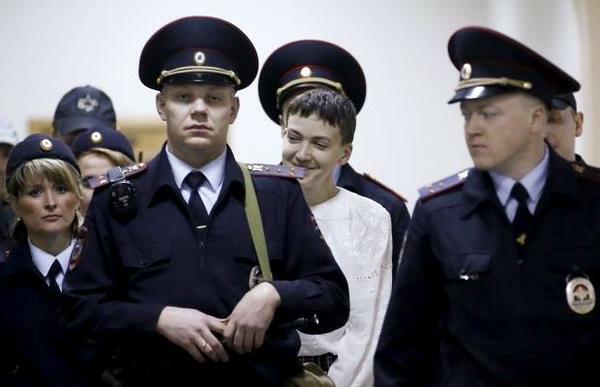 Over the ten months that Nadiya Savchenko has been kept in the Russian detention facilities, we, her defense, have gathered a large body of evidence that directly points to her non-involvement in the death of Russian journalists Kornelyuk and Voloshin, and proves that she has an alibi. But the Investigative Committee, stubbornly, despite already having the evidence, continues this investigation with a presumption of guilt. Today, the investigator stated that they have, indeed, received a variety of evidence from the defense, but the Investigative Committee has not assessed it yet. And the Basmanny District Court is, essentially, once again abetting the investigators in conducting criminal proceedings in this case in an unlawful manner. I am handing the floor over to my colleague now. He will talk about today’s hearing in more detail. 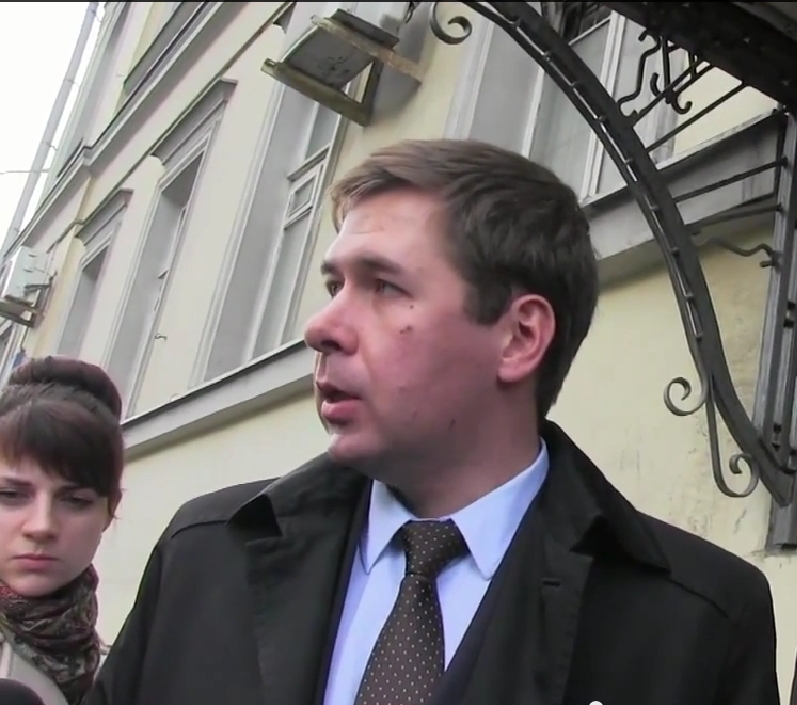 ILYA NOVIKOV, attorney: Today’s hearing had two important purposes. About the first one… As you have seen, our line of defense in the case of Nadiya Savchenko is always open and transparent. We always share our materials and explain what we are doing, how and when. The investigation is doing the exact opposite. They never explain anything, and never inform as to what materials they have or what they intend to do. Therefore, there will be several hearings like the one today, before the case is submitted to the court with the substantive charges. Each time, we will provoke the investigators into explaining something to us – about their plans, their view of the situation. As of today, they are essentially refusing to speak. Their position remains that they will investigate Nadiya Savchenko’s case and keep her detained for as long as they see fit – which is, of course, wrong. The second purpose of today’s hearing for us was to put a stop, at least on the conceptual level, to the talks about the alleged lack of Nadiya Savchenko’s immunity as a PACE delegate, or that her immunity is not valid in Russia. She has such immunity. We did not count on the court being on our side in this, but we got the opportunity to speak on the subject. And, despite the court’s position, we still believe that the Russian investigation should have dropped the case against her as soon as it became known that she is a PACE delegate. This is a delicate legal issue. It is not obvious and requires thorough research of the situation – but we have researched the situation, and we are confident in our position. This is why today’s ruling will not be final. We will continue bringing up the issue of [Nadiya Savchenko’s] PACE delegate status – in Russian courts, in foreign courts, and before PACE itself. PACE is, first of all, interested in its delegates actually having the immunity to which Russia agreed when it joined the Council of Europe. Today, we have driven another nail into the lid of the procedural coffin of the position held by Russian investigators. We have, once again, received proof that they do not want to admit that under which they have signed, and refuse to respect the privileges and immunities that Russia guaranteed back in 1996, upon its entry into the Council of Europe. This will not bode well for them – but may bode well for all of us. NIKOLAY POLOZOV: I would like to add that soon, here at the Basmanny Court, there will be another hearing, held by Judge Arthur Karpov, dedicated specifically to Nadiya Savchenko’s status as a PACE delegate and her immunity. I hope that this hearing will be held shortly, as the PACE session starts next week. Perhaps the court hearing will coincide with that date. ILYA NOVIKOV: We will certainly appeal this resolution. Moreover, in the passing of this resolution, the judge refused to call up representatives of the Ministry of Foreign Affairs and the Ministry of Justice. This is sufficient reason to address the Constitutional Court. We will let neither the investigation nor the court work in peace and quiet, in the way they would prefer to. We will harass them, daily and weekly. VALERIY SHREYDLER: Do you think that the adversarial principle in this process has been violated? Can you feel the element of political pressure? NIKOLAY POLOZOV: Concerning pressure and such. The investigation of this case is certainly being conducted unlawfully. We are observing a deep deformation of the legal field in the conditions of an authoritarian system. This is not the only case being investigated in this way. But this is the first case in the history of the Russian Federation, when an active member of the Parliamentary Assembly of the Council of Europe is being detained, without any grounds for that. This is a flagrant disregard of law, and I think that international authorities will, sooner or later, declare the actions of the Russian government unlawful. PACE has already issued a resolution to that effect. VS: Is the date of the next hearing known already? VS: Please tell me what is going on here. We have not heard a single valid explanation why the appeal is being denied. Why? NP: There can be no valid explanation, because there are no lawful grounds for the denial. There is a political will that dictates how the Investigative Committee and the courts should act. Not the law, not justice – but political will. Let me remind you that, a year ago, a special administration for the investigation of cases related to the unlawful means and methods of warfare was created as part of the Investigative Committee. This administration only investigates cases related to Ukraine. No country in the world, no authority had departments that would only investigate crimes related to one specific country or one specific person. Here, we can see a progressing degree of lawlessness, and pin-pointed repressions that can eventually become far from pin-pointed. The society is passive, and has no trust towards the court system, but the gentlemen from the Basmanny court are not bothered by that in the slightest. They know that the government will cover up for any unlawful resolutions they pass. VS: Nikolay, there was a reason I asked about the adversarial principle. Given the current political pressure, have you been left with any possibility to fight fairly and with dignity, to stand up to everything that is going here? NP: Let me say this. In a situation of complete lawlessness, when the prosecutor’s office, the investigation, and the court are all working exclusively on the side of the prosecution, the only bearer of law and the only flash of light is the attorney. Therefore, however pointless our work may seem, even if it looks like we are hitting our head on a wall to no effect – I hope that one day, quantity will turn into quality. While there still are defense attorneys who are not afraid to stand up against the system, maybe not all is lost yet. VS: Nikolay, one last question. None of the journalists asked about Nadiya Savchenko’s state of health. I am not a regular journalist, I don’t work for federal channels. Tell me, how is she feeling, physically? After all, this long hunger strike had to affect her health. Is it true that she is ready for the fight that awaits her, from the medical point of view? NP: First of all, I must say that Nadiya has a very strong body and health, and, most importantly, she has courage and fortitude. Those are things that allow people to withstand hunger strikes without burning out and self-destructing. She is accepting small amounts of food. Being faced with the choice to be hospitalized and force-fed, or eat at least something and remain in the current conditions, I think it is a reasonable compromise. Secondly, her state of health lets us stay hopeful. Her health is satisfactory, without any significant pathologies, and I hope that the current state of things will help her hold on for a long time. Another matter is that being detained based on unsupported charges, after being kidnapped from her country and thrown behind bars in another country – that is difficult, morally. But you can see that she is holding on. She is holding on, and she deserves all the respect and glory for that. VS: As your old acquaintance, I would like to ask you to say a few words for Ukraine. You and I are Russian citizens, but this report will be seen in Ukraine. Please look at the camera and say a few words to Ukrainians – from the President to every worker, to the guys in trenches. NP: Dear Ukrainians! Do not give up! Keep fighting! Nadiya’s fate also depends on you. Glory to the Heroes! VS: Glory to Ukraine! Glory to the Heroes! This entry was posted in #Free Savchenko, English, English News, News, Opinions, Pictures, War in Donbas and tagged #FreeSavchenko, #freesentsov, #Human_Rights, #Nadiya Savchenko, #RussiaInvadedUkraine, #SaveUkraine, #StopRussianAggression, #UkraineUnderAttack, Russia, Ukraine, war in Donbas. Bookmark the permalink.